In the annals of TV history, has there ever been a wonderfully weird show like SpongeBob Squarepants? It is only outdone by the fact that it has been around the 90's and has produced two of the weirdest film adaptations, along with this musical. Still, if the show is going to be make its way to Broadway, it's best to be as big and earnest as possible. While this isn't commentary on how it looks visually, it's still weird to think that a yellow sponge singing onstage would look cool. But the Tonys seem to think so, so let's look into one of the most interesting nominees of the year, featuring dozens of songwriters including some that have passed away (R.I.P. David Bowie). How does it all come together? Listen on. 5. "When the Going Gets Tough"
6. "(Just a) Simple Sponge"
8. "Hero Is My Middle Name"
9. "Super Sea Star Savior"
13. "Chop to the Top"
14. "(I Guess I) Miss You"
15. "I'm Not a Loser"
17. 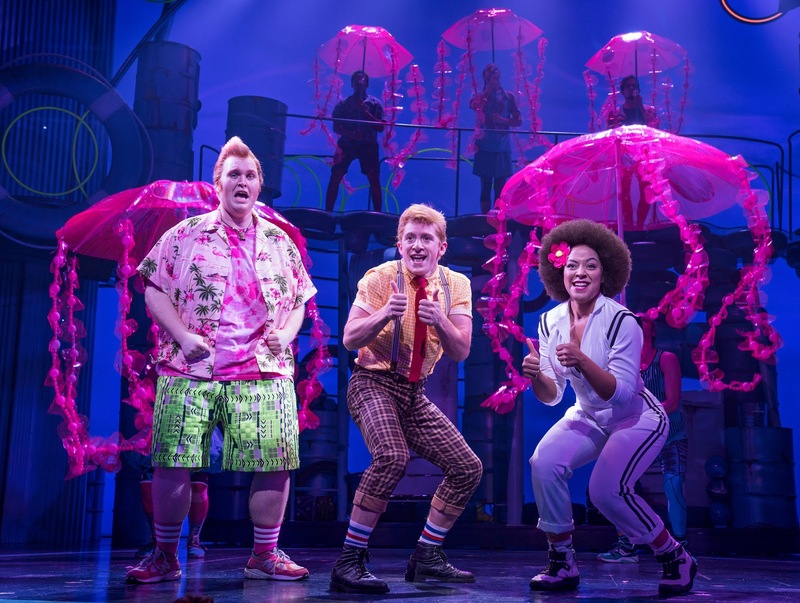 "Finale: Bikini Bottom Day Reprise"
All things considered, this is the perfect way to open up a SpongeBob Squarepants musical, especially as it introduces the central characters through song. It's an upbeat melody that is instantly memorable and captures the joy of the series. By the time that it shifts over to the plot, it begins to build momentum and create a sense of wonder. Fans of the series will find plenty of the lyrics clever and interesting, especially the fact that the singers sound just enough like the cartoons to get by, but aren't distracting about it. Even if the rest of the show is a mishmash, this sets the tone in a way that would make any kid want to be a musical fan, and that alone is a testament to this weird experiment. This seems a bit of a cheat, since its placement on the soundtrack suggests that it's part of the post-show curtain call. Still, it's on the soundtrack and should be considered. If you were at all an adolescent in the past 20 years, there's a good chance that you at least know the first line. This is an easy way to get the audience enthusiastic, especially after a show with such an earnest and upbeat set of songs. It's just a cover essentially, but it's a nice way to summarize the enthusiasm that the people on stage and the audience have for the franchise. It almost seems sacrilegious to leave it out. One of the most incredible things about this whole show is that it has more than comedy on its mind. SpongeBob actually has a very emotional, existential song at the center of Act I that plays to the raptors with a power and awe. Seeing as the whole show in some capacity is about self-worth, it's the perfect centerpiece that mixes theme with backing vocals that fade with inspiration and sadness in perfect measure. For a show that seems set on being as silly as possible, the fact that this song lands so beautifully creates a sense that this gambit was worth embarking on. Had this song failed, there is a good chance that the whole show would've been a cynical exercise in, as Mr. Krabs would say, money. To be honest, this is a soundtrack devoid of outright bad songs since the structure is so wonderfully scattered. In fact, most of them are catchy and endearing in just the right measure with none outstaying their welcome. With all of this said, I mostly chose this song by virtue of it having the least to do lyrically with plot. There's nothing wrong with the Aerosmith musicians' interpretation of what a boogie song would sound like. It's actually kind of fun. However, it doesn't have more to do than just give the characters a chance to dance and have fun. Again, it's not terrible, it's just that this show lacks enough bad moments to pick a legitimate low point. In theory, this adds nothing to the story since it's not based on any specific plot of the show. However, it plays into the general structure of the series in which SpongeBob and his pal Patrick go on adventures. There's the hijinks that they get into, which seems to involve pirates and Patrick becoming a super sea star savior. It's all manic and plays into all of the iconography you'd expect from the Nickelodeon series. Again, this isn't a commentary on the visuals so there's likely more to add in costuming and sets. However, it does capture the youthful absurdity and joy that the characters bring to their various stories throughout the series and movies. This was my biggest concern going in, as the idea of adapting this show to stage was desperate. However, it is sometimes one of the most enjoyable musicals nominated this year. For a show as manic and rule breaking, it really has a focus that allows the characters to develop and explore musical styles in a way that could be ushering in the next generation of Broadway fans. That alone makes it special. The fact that it also has a lot of catchy tunes written by dozens of people and that it mostly works as a coherent piece is beautiful. It's weird enough that it doesn't betray its source material, yet it feels like it elevates it through song in a way that I felt like Mean Girls didn't. It doesn't rely on references solely for hooks, but instead expands on ideas in a way that provokes and entertains. Coming Soon: With movie-adapted stage musicals up for Tonys this year, expect one more column on Best Musical nominees The Band's Visit in the next few days.